Dig into ribs, smoked chicken, salami and more at this BBQ spot. Open Sun., Tues.-Thurs. 11 a.m.-4 p.m., Fri.-Sat. 11 a.m.-8 p.m.
: Frank Vinciguerra and Mike Ireland, alums of Pappy's Smokehouse, are behind Adam's Smokehouse. Ribs are seasoned with a signature rub, smoked slowly and then slathered in apple butter glaze. 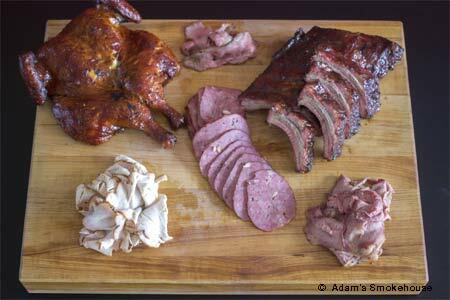 You'll also find smoked chicken, pulled pork, salami, turkey and tri-tip. Add on sides of pit beans, coleslaw, potato salad, chips, pasta salad or homestyle applesauce. Bottles of signature sauces are available for purchase.